Climate models have predicted a total summer Arctic sea ice melt occurring no sooner than between 2070. Now, with current melt trends, the Arctic is expected to be free of ice in the summer as soon as 2030, and some think even sooner. With an ice-free Arctic in summer, many nations are scrambling to stake their claim for exploitation of the polar regions. Russia recently sent a mini-submarine to the North Pole to plant a flag on the Arctic sea floor, claiming that an underwater ridge connects to the Siberian continental shelf means they own it. While that seems a little silly to me, I’m sure the Russian don’t think so. It’s the stuff wars and other undesirable tendencies are made of and is symbolic of the growing Race for the North from the world’s dominant powers. Canada isn’t much pleased with Russian claims to the Arctic, Denmark has sovereignty over Greenland, and, of course, the United States has its own idea of how the Arctic should be managed. Everyone wants their shot at the vast stores of oil and natural gas. There’s an irony here, of course. As the severity of the impact of climate change increases in the arctic, opportunity for resource extraction and exploitation, as well as possible shipping opportunities through the still-mythical Northwest Passage, increases as well. In turn this enhances the positive feedback cycle of increased warming and melting, thus further increasing the damage done by global warming not only to the Arctic, but to the entire globe. One has to wonder what the world will look like once we’ve taken all we easily can from the arctic. Does anyone think it is the kind of world they’d want their children’s children’s children to live in? Instead of scrambling to exploit the pristine, fragile, and already stressed arctic, we should scramble to seize the opportunity for a new way of doing business. 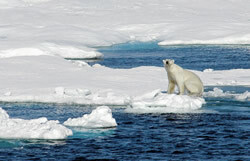 The melting sea ice is a warning signal, not another opportunity to exploit the environment beyond what is sustainable. It may take ten years, it may take a hundred, but there is no doubt that a relentless and dogged pursuit of every last extractable source of fossil fuel will one day collapse. The opportunity is here for us now to turn away from this folly and begin to exploit our human capacity to employ wisdom and foresight. To not only be clever, but wise.